Micrurus fulvius tenere or better known as the common Coral snake, is a beautiful creature, but should be feared for its deadly potential. 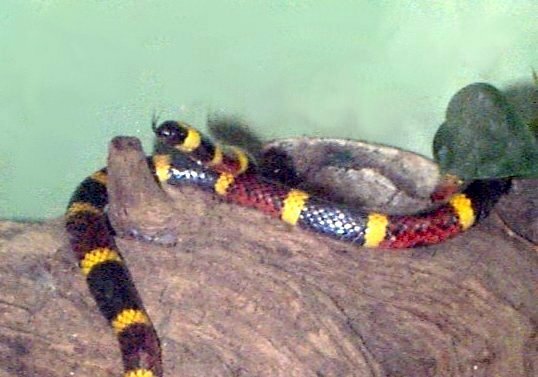 The common Coral snake that lives in North America is most often encountered in the south eastern states. The snake likes the wet climate. The Coral snake is easily recognizable for its bright colors. It is a banded snake with bands of black and yellow on its head and tail. 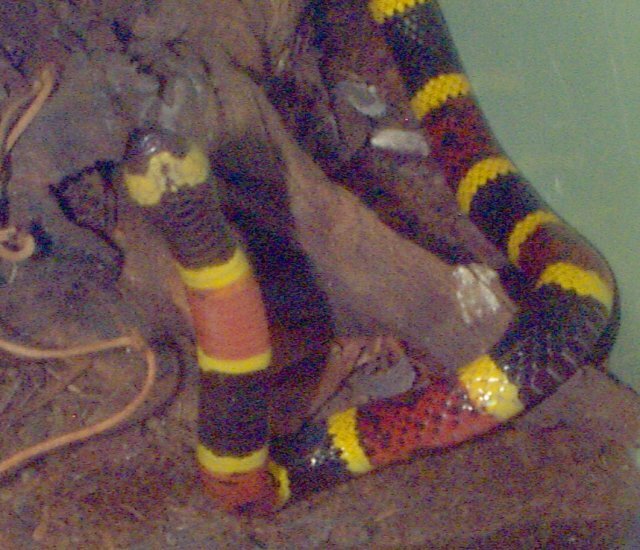 It is banded with black, yellow and red in its midsection. But despite its vibrant colors, one should steer clear of this highly venomous snake. The Coral snake is a venomous snake, but it is not a viper like many venomous snakes. It is an elapid. It has short, fixed fangs that secrete its neurotoxic venom instead of pumping it through long hollow fangs as the vipers do. The snake's diet of small snakes, lizards, and amphibians is a must for such a thin snake. The snake bites and must hold on tightly to its prey for the venom to make its way into the body of the unfortunate victim. The Coral Snake then swallows the subdued prey whole. I have encountered a coral snake in the wild and was at first drawn to it for its beautiful colors, but soon realized what a dangerous animal it was. I left the scene imediately hoping it would not follow. Snakes are not hostile creatures and with a little bit of care, we can all admire even the most dangerous creatures without any worries. I hope that you have the opportunity to see a coral snake at a local zoo where you can admire it in safety. Publishing company Inc. : Racine, Wisconson,1956. Coral Snake. World Book Encyclopedia. Vol 4, p 1051. World Book, Inc.: Chicago, 1990.
one of the most comprehensive animal sites on the web! Special thanks to Adam Harrison for his instruction on how to write html.